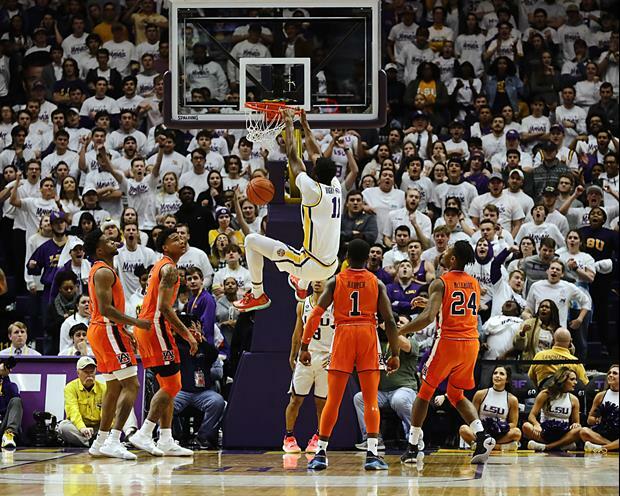 Per LSUSports.net: BATON ROUGE – The LSU Tigers overcame a 16-point deficit midway through the first half to defeat the Auburn Tigers, 83-78, Saturday afternoon in the Pete Maravich Assembly Center. LSU improves to 19-4 (9-1), while Auburn falls to 16-7 (5-5). Junior guard Skylar Mays finished with a team high 20 points for the Tigers. He also had three rebounds and three assists. Sophomore guard Tremont Waters finished with 19 points, in addition to a game high 10 assists. He also recorded 3 rebounds in the double-double effort. Senior forward Kavell Bigby-Williams recorded a game high 10 rebounds to complement seven points scored. Up Next: LSU at Kentucky on Tuesday, February 12 at 6 p.m. CT (ESPN). Can you imagine how dangerous this team will be when we can start games hot? We have been phenomenal the second half of our last 4, just want to see us put together a full game and there are few teams that can beat us. Meant to be an upvote on STTDB! Auburn "Plainsmen", "Tigers", "War Eagles" have a live Eagle mascot named "Tiger" and a fake Tiger named "Aubie". Whoever they are we beat 'em. Being able to shoot really well at the free-throw line is always the mark of, in the words of Les, quality teams. Auburn lived and died by threes and turnovers. They couldn't stay hot all game. What scared me was the bad passes late in the game. 4:56? Surely that can't be a clock, with the game ending around 3. Bigby is a monster in the paint but this team as a whole sure can rebound. The free throw shooting surely helps as well. Big win to set up a big match up against big blue. Let's Geaux.